When did the first Lendrum find them-shelves in Ireland? 1814: John Lendrum - born Enniskillen, County Fermanagh. He served in Dublin Militia, Royal Irish Artillery - discharged aged 50 yrs. 1824: Peter Lendrum (Scarth?) Excise man in Scotland. Magistrate: Mr. Lendrum also present was not dismissed because he was there by special direction of the Lord - Lieutenant to preserve public peace. This Andrew appears to have the first of the name in this district. Residence of George Lendrum Esq. Andrew was Principal (wife - Lady Superintendent) of St. Margarets College, Crieff. School for young ladies. 1910: Andrew Lendrum - Farmer, Rathkeeraubeg, Dromore, County Tyrone. 49 acres of land at Culleymane, Co. Tyrone. Rent 48.15.0. stg per annum. (Reservations concerning mill dam to lessor). Hugh Montgomery, Castle Hume, Co. Fermanagh, to John Lendrum, James Lendrum Snr, and James Lendrum Jnr, all of Culleymane. Lease for two lives from 1 May 1792 of land at Beagh, Co. Tyrone. Rent 9.2.6. per annum. Hugh Montgomery, Castle Hume, Co. Fermanagh, to James Lendrum, Beagh. Lease for three lives from 1 May 1792 of 21 acres of land at Mullaghmore, Co. Tyrone. Rent 20.16.0. per annum. Hugh Montgomery, Castle Hume, Co. Fermanagh, to George Lendrum, Mullaghmore. at Beagh Co. Tyrone, with the right of lessor to dig turf. Rent 15. stg per annum. Margetson Armar, Castle Coole, Co. Fermanagh, to Andrew Lendrum, Francis Lendrum and Robert Lendrum, all of Beagh. tenement at Fivemiletown, Co. Tyrone. Rent 5.5.6. per annum. Hugh Montgomery of Blessingburne Cottage, to Joseph Lendrum, Fivemiletown, both Co. Tyrone. James Lendrum, Jamestown, Co. Fermanagh, to Matthew Thompson, Derryallen, Co. Tyr. Lease of 15 acres 3 rods for 19 years from date (with covenant of renewal, if grand lease from Bishop of Clogher be renewed) Rent: 23.12s.6d. p.a. + dues. Upper Corkhill, Co. Tyr. A map and survey of part of Corkhill, Parish of Killskerry, Co Tyrone, part of the estate of James Lendrum Esq, surveyed in 1808 by George Robinson and maps of estate of James Lendrum in Cos Fermanagh and Tyrone surveyed in 1788 by Nicholas Willoughby. The Rt. Hon. Archibald, Earl of Gosford to John Simpson, Ballyards, Co. Arm., and Anne Atkinson, Lisnadill, Co. 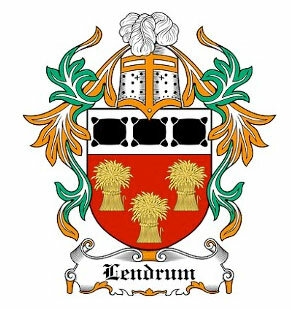 Arm., for themselves and in trust for Lendrum Clarke, son of Revd. James Clarke, decd. Renewal of Lease - Latmacollum, Co. Armagh. Description : Nomination of the Rev. Joseph Lendrum to the Curacy of Derryvoylan, [sic] [Derryvullan]. James Lendrum, Magh post-marked Enniskillen, to Stewart, Clare Street. 'You had not the least occasion to give yourself the trouble of writing to me for me assistance on the approaching gene Dates : 2 January 1776 - James Lendrum, Magh, post-marked Enniskillen, to Stewart, Clare Street. 'You had not the least occasion to give yourself the trouble of writing to me for me assistance on the approaching general election, and I will even hope there is not the least danger of any opposition, and was there, you might rely on all the assistance in my power. On the last election, I was well inclined to serve you or any of your family, but since the honour of your acquaintance and friendship, particularly in regard to the removal of my brother (though it did not succeed), and that without scarcely a solicitation, will never be forgot by ...'. Lendrum is very bad and at his age not likely to improve. I hope however ... [that] the church is in good order and the sexton orderly in his person and clean, for I found serious fault in that respect. I will thank you to inform our worthy friend and relation, the Bishop, that I will thank him to avail himself of an accidental interview with the Bishop of Clogher ...' At Lord Templetown's request Blayney has supported Mr Gooch as successor to Lendrum. '... Mr Lendrum appears an enemy to order, decency and good example. Therefore ... N.A. [should] submit to his Lordship the propriety of either transferring Mr Lendrum to a mountain or appoint a person capable as curate to support the character and perform the duties of the situation. It is a heart-breaking reflection, after the pains I have taken, and the expense incurred, that all should be destroyed by a beast of that nature.